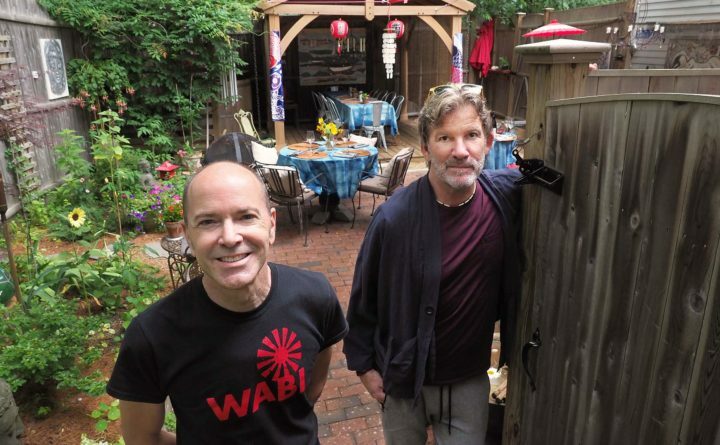 Steven Couch and Chef Mike Fennelly stand at the entrance to their new establishment, Wabi Cafe and Shop. YORK, Maine — Michael Fennelly has started his own restaurants in New Orleans and San Francisco, and has been head chef in Santa Fe, Hawaii and Provincetown, Massachusetts. He’s prepared dinners with the James Beard Foundation, was named to Food and Wine’s Top 10 New Chefs in 1994, and has been a guest chef on the PBS show Great Chefs and on “lots” of Food Network shows. And now he’s bringing all those years of knowledge, experience and culinary mastery to York. He and partner Steve Couch are making quite a splash at the town’s farmers’ market these days with the regular appearance of their food truck, and discerning gourmands have already made their way to their “modern Zen cuisine” restaurant, the Wabi Café, for lunch or Saturday night dinner. “Way before Asian fusion was popular,” he created a menu of such dishes as Chinese dumplings and smoke pheasant spring rolls. “I was doing something way outside the box for that time.” His work earned him the attention of “the big magazines” and launched his career. Fennelly is the chef, and Couch, exactly the kind of friendly person you’d want as a flight attendant, is the baker and runs the front of the house — an outdoor café that can seat 15-20 people. The menu he’s crafted reflects that. The café is open for lunch from 11 a.m. to 3 p.m., Wednesday through Friday. The menu includes items like handmade turmeric wrappers of potato, corn, carrot, peas and garam masala and umami sauce that Fennelly makes fresh. A Maine seafood or vegetable spring roll, tacos with tempeh or Hawaiian pork, and miso soup are also on the menu. Many of these dishes and others, including a wonderful vegetarian burger, also are for sale at the Wabitruck, a food truck that the couple brings to the Gateway Farmers’ Market every Saturday. The lunch and truck menu is reasonably priced, with most dishes $10 and under. On Saturday night, the café offers a prix fixe menu, a five-course, typically themed meal for $35 per person. On July 14, it was a “Wabi Goes Greek” menu which included a Greek salad, chilled Greek yogurt soup, several entrees all seared with rosemary and a cashew and almond baklava. “I do everything from scratch — all the noodles, all the wrapping. And to the best of my ability, it is all local and organic,” he said. The café also offers beer, wine and sake. Fennelly also makes sauces and rubs that are available for sale in the small, second-floor gift shop and gallery of his work. The goal is for the café to remain open through the fall.